Please note: This is a copy of our newsletter email sent on 12th September 2018. The products, offers or vouchers mentioned may no longer be available. Please do not contact the merchants if an offer mentioned is no longer available on their website. Tesco Wine by the Case is sadly coming to a close. Don't worry though, you'll still be able to purchase all the wines you know and love through Tesco.com. 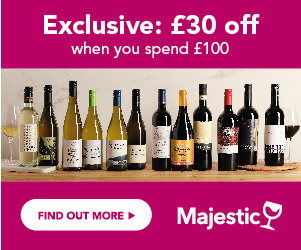 What this does mean however, is that there are currently some unbeatable clearance deals on the 'Tesco Wine by the Case' website. Right now, you'll get 45% off New Zealand Sauvignon Blanc, 50% off Spanish Albarino and almost 60% of Australian Cabernet. But you'd better head over there fast as they won't be around for long! There’s nothing better than a soothing glass of wine to ease you into autumn as leaves fall. Majestic Wines know this and that's why they're introducing ten BRAND NEW wines ideal for the season are raring to please your palate. Save up to 30% (Mix Six price) now. Hurry though, it’s for ONE WEEK ONLY! Cellar by Waitrose & Partners, are offering 1/3 off a huge selection of irresistible wines. From Champagne to Chablis, you're sure to find a great bottle at an even greater price. So treat yourself this week, and head over to the website now. M&S are giving you the perfect excuse to raise a glass this month, with their 'buy more, save more' deal. Purchase 2 or 3 cases of wine from their selection and save 10%. Purchase 4 or more cases, and save 15%. So, don't let the cooling climate get you down. Head to M&S and transport yourself to your favourite Wine Region. Absolut, have introduced two delicious new additions to their vodka range and they're sure to be a crowd pleaser. Absolut Apple and Absolut Strawberry combine vodka with fruit juice for a sweet and refreshing twist. Serve with soda, fresh fruit and plenty of ice and the summer will seem positively endless. What's more, the prices have been rolled back, from £16 to just £13 per bottle. Why not try both? Fear of missing out that is! If you haven't claimed yet make sure you don't miss out on a FREE case of beer from craft beer specialists, Beer52. Sign up to the Craft Beer Discovery Club and all you'll have to do is cover the cost of postage and packaging (£2.95) and your crate will be on its way to you! It's that simple.